Want a nicely wrapped package with a few twists and turns? 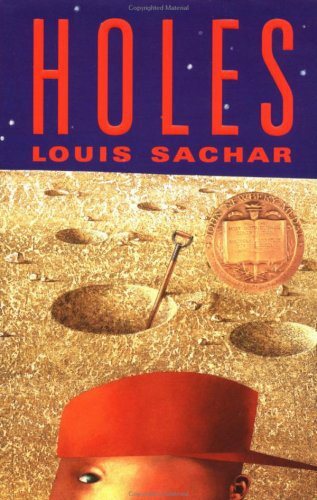 Try Holes, by Louis Sachar. This one won the Newberry back in 1999, and for good reason. Why haven’t I read this one before now?? Stanley Yelnats (love that!) isn’t very lucky. He was arrested for something he didn’t do and sent to Camp Green Lake. Except it’s not really a lake. And it’s not really green. As a matter of fact, it’s not really a camp either. It’s a juvenile lockup facility in the middle of the desert. They don’t even fence these guys in. There’s no where to run. Every morning at 4:30, Stanley and the other boys are given a shovel and taken to the dry lake bed where they must dig a 5-foot deep/5-foot round hole. Stanley has no idea what they’re looking for, though due to some clever back story, the reader begins to piece together a puzzle that started 150 years ago, with Stanley’s no-good-dirty-rotten-pig-stealing-great-great-grandfather. Throw in an onion man, an outlaw, a mule, and a few poisonous yellow-spotted lizards and you have a recipe for an entertaining read! I absolutely loved this one and read it all in one sitting. It’s humorous. It’s clean. And the writing is so refreshingly crisp. Every last detail has significance that comes ‘round in those “ah-ha!” moments that are so fun to figure out. I read a number of reviews with complaints that this book contains events that are disturbing and graphic. I didn’t feel that way at all. No, the boys aren’t treated too well at the lockup facility, and some bad stuff happens. But the plot is so ridiculously unlikely, silly even, that it shouldn’t be taken too seriously. It’s fiction! And clean, well-written fiction at that. Two thumbs way up on this one. Highly, highly recommended! I did have a squeaky award on this one, didn’t I? Sigh. I haven’t been doing so well moving these posts over from my other site. I feel like I wasted a lot of time with that site, except I learned so doggone much about website design from it. Have never heard of this book. Sounds very usual! It’s always fun to discover a book that is very good. It’s a good one, Pat. Not terribly deep or emotional, really. Just fun and clever. My daughter, to whom I handed the book off as soon as I was done and who also read the whole thing that same day, still talks about it. Great book. I think it might have been one of first (if not THE first) YA novel I read as an adult. Really enjoyed it. It was silly at parts and I remember some pretty intense parts as well (without giving any spoilers). In a way, reminded me of a series I read in my own younger years. The War Between the Pitiful Teachers and the Splendid Kids. Maybe a little darker than Holes, but similar themes. So have you seen the movie version of Holes? I read the book several years after the movie when I saw it on my stepdaughter’s shelf, but I still haven’t seen the movie. Can you believe it? I haven’t seen the movie yet, either! It took me fifteen years to get to the book. Maybe I’ll remedy that before another fifteen years pass. I read this book a couple of years ago and like you, was very impressed. I haven’t seen the movie. I’m not sure that I want to see the movie. I’m ususally disappointed.